We believe that “promoting self-help, rather than offering sympathy” to our disabled members is the most effective way for members’ rehabilitation and usefulness in a country that has had a long struggle with militancy, gender inequality, caste system, discrimination, human rights’ violations, political mismanagement and poverty. On meeting Rob Buchanan from a NZ- based organisation MEND, in 2004, she decided to set up her own organisation to help others, like herself, who had been neglected and wanted help to uplift themselves. In 2009 the permanent Hope Centre ground floor was built on donated land with funds raised by MEND members Charlie Crossley and his Runners, UK, raising 2500 pounds, Harish and Jyoti raising NZ$5000, and Kathy and Len Light donating NZ$5000, a total of NZ$15,000. Current main funders in 2011 include a UK-based Nepali organisation, a US based donor agency, a Finnish based agency, Rotary International, Handicap International and MEND from NZ. Hope Board and staff also interact closely with local government, the Women’s Development Committee, Army and Police to ensure changes are steadily made to address human rights issues and violations in the district. Poverty alleviation, community-based health, promoting human rights and access, education, gender equality, skills’ training, disability awareness and counselling are all covered regularly each day at Hope Centre as part of our mission. Hope Centre also works with the District Women’s Development Committee to enhance disabled members (and women’s) rights and access to government benefits and pension. Besides rehabilitation services offered at Hope Centre that allow any disabled person in the district to receive low-cost physiotherapy, counselling, hearing aids and referral to medical services, two grants in 2007 and 2010 from ABILIS Finland have allowed the Hope team to provide skills’ training opportunities to disabled members, that is followed-up with micro- credit loans so they can start their businesses. To identify patients with disabilities Hope Centre carries out regular community-based assessment camps where all village people are requested to bring family members with any disability to receive an accurate assessment and referral for treatment. Hope Centre helps the poor with the cost of corrective surgery and then follows-up all past treatment. While in the field Hope staff gather data and information about the patient’s families, financial needs and problems at home such as access to toilets and buildings, if any education, if parents are providing adequate care and if parents are abusing them in any way. If problems exist at home then parents are counselled and solutions sought through negotiation and if that fails, by legal means. If parents have alcohol dependency we send disabled youth for stable education to boarding schools. Since establishment in 2006 Hope Centre has assessed, counselled and treated more than 2000 disabled persons, while referring and paying for about 500 for treatment to other medical facilities including surgery, limb-fitting and hearing aids. With two skills’ training grants and financial support from Hope, about 80 disabled youth have gained practical experience to be able to earn an income. Hope Centre was selected as the most active local NGO in that district. 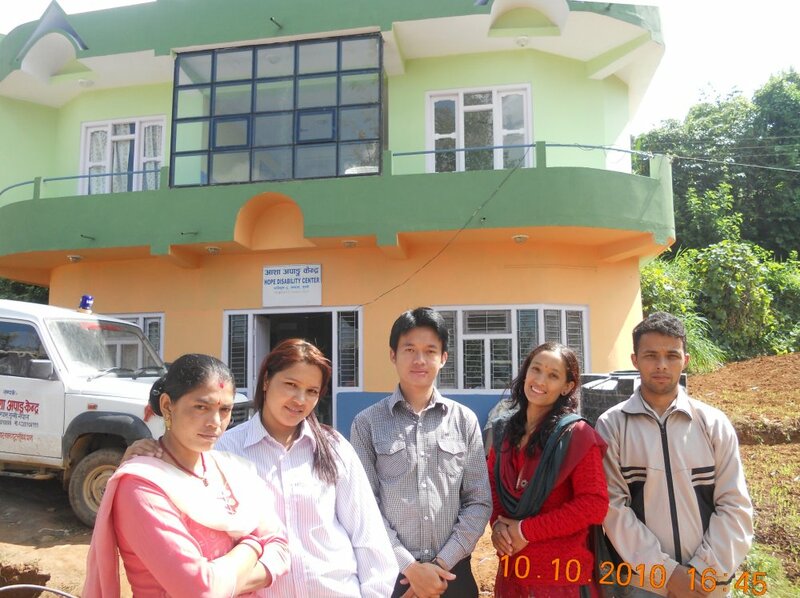 The Hope Board and staff are young, active and keen to make Gulmi District one of the first districts of Nepal that has been fully surveyed and with all disabled patients identified and given some treatment.